Q: President Donald Trump will pay a visit to China on November 8. He is the first head of state to visit China after the 19th National Congress of the Communist Party of China (CPC). How does the Chinese side view the special significance of President Trump's visit at this moment? A: At the invitation of President Xi Jinping, President Donald Trump is about to pay a state visit to China. This is the first state visit received by the Chinese side following the successful conclusion of the 19th National Congress of the CPC. Against the backdrop that today's world is in the midst of profound and complex changes, the heads of state of China and the United States are going to meet in Beijing to have another strategic exchange of views on major issues of common interest, reach new important consensus on the basis of the Mar-a-Lago meeting and the Hamburg meeting, enhance mutual understanding and friendship and advance the exchanges and cooperation in various areas. This is of great significance to facilitating the sound and steady growth of China-US relations in the new era and promoting the peace, stability and prosperity of the Asia-Pacific region and the world at large. 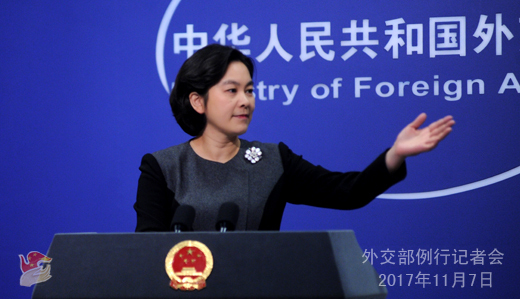 Q: According to the introduction of the Chinese side, China will give a "state visit plus" reception to President Trump. Can you tell us the other special arrangements in addition to the "routine practices" of the "state visit"? A: When President Xi Jinping visited Mar-a-Lago this April, President Trump and his wife offered a hospitable and considerate reception to President Xi Jinping and his wife with high-standard and thoughtful arrangements being made in all respects. We Chinese people believe that courtesy calls for reciprocity. The Chinese side attaches great importance to President Trump's visit to China. Besides the whole set of activities for the state visit, the Chinese side will also arrange the small-group and informal interactions between the two heads of state, which can give them enough time to have an in-depth exchange of views on major issues of common interest. Recently, the work teams of the two sides have maintained close and sound communication on the specific arrangements of President Trump's visit to China. I am convinced that through the concerted efforts of the work teams of both sides, this visit will achieve historic success. Q: It is reported that the three US aircraft carriers will carry out joint drills in the Western Pacific quite soon, which is scheduled at a time when there are tensions over the Korean Peninsula. Is China concerned about the timing of the joint drills? A: We have noted the relevant report. Currently, the situation on the Korean Peninsula is highly complex and grave. All relevant parties should exercise restraint, avoid provocating each other, jointly stay committed to easing the tensions on the Peninsula and meanwhile make positive efforts to pull the Korean Peninsula nuclear issue back to the track of seeking settlement through negotiation at an early date. Q: According to media reports, prior to US President Trump's visit to the ROK, when having an interview with the American Broadcasting Company, the ROK Foreign Minister called for resolving the Korean Peninsula nuclear issue through peaceful and diplomatic means and strongly opposed any military action. Kang Kyung-wha said that she will not allow the Korean Peninsula to descend into war again. What is your comment on this? A: The Chinese side has always called for realizing the denuclearization of the Korean Peninsula through political and diplomatic means and upholding the peace and stability of the Peninsula. This serves the shared interests of all relevant parties and also represents the requirements of the relevant resolutions of the UN Security Council. We call upon all relevant parties to make positive and constructive efforts to this end. 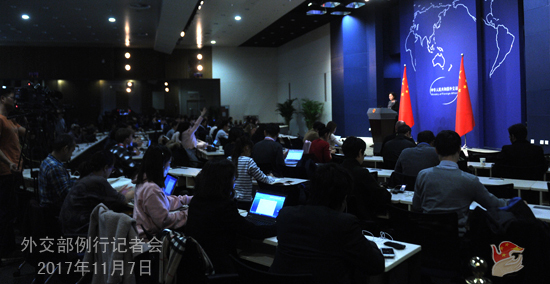 Q: General Secretary Xi Jinping pointed out in the report delivered at the 19th National Congress of the CPC that China is moving closer to center stage. How will China avoid strategic conflict with the United States which is now at center stage, in other words, falling into the so-called "Thucydides's Trap"? A: Both the world and the international stage are large enough to accommodate the sound interaction and friendly co-existence between China and the United States. President Xi Jinping pointed out in the report delivered at the 19th National Congress of the CPC that China will be committed to building a new type of international relations featuring mutual respect, fairness, justice and win-win cooperation and fostering a community of shared future for mankind and calls upon all nations to seek a new path for state-to-state relations characterized by dialogue and partnership rather than confrontation and alliance. This provides a new model for handling state-to-state relations in today's world and charts the course for and injects new impetus into the development of China-US relations in the new era. As the largest developing country and developed country in the world, the top two largest economies and two permanent members of the UN Security Council, China and the United States have extensive common interests and shoulder special and important responsibilities in upholding world peace and stability and promoting the global development and prosperity. 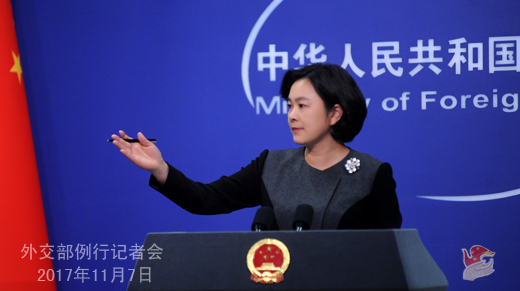 The Chinese side is willing to work with the United States to act upon the important consensus reached by the two heads of state to focus on cooperation and properly manage differences in the spirit of mutual respect and mutual benefit so as to ensure the sustained, sound and steady growth of China-US relations. This not only serves the fundamental interests of the two peoples but also meets the shared expectations of countries around the world and the international community. Q: What consensus does the Chinese side expect to reach on the Korean Peninsula nuclear issue during the meeting between the heads of state of China and the United States? A: China and the United States have shared interests in promoting the realization of the denuclearization of the Korean Peninsula and maintaining the peace and stability of the Peninsula. During the meeting between the two heads of state in Beijing, the two sides will have an in-depth and strategic exchange of views on major issues of common concern, including the Korean Peninsula nuclear issue. We are willing to maintain close communication and coordination with the United States on the basis of mutual respect and make unremitting efforts to promote the proper and peaceful settlement of the Korean Peninsula nuclear issue. Q: The Japanese government has stepped up its sanctions against the DPRK by adding some DPRK individuals and entities based in Russia, China and the United Arab Emirates to the sanction list. What is your comment on this? A: We have taken note of the relevant report. China's position is quite clear-cut. We are always opposed to the unilateral sanctions imposed by one country on other countries outside the framework of the UN Security Council. Q: It is reported that yesterday, during the summit session between Japanese Prime Minister Shinzo Abe and US President Donald Trump, the two sides reached agreement on the strategic concept of building a free and open Indo-Pacific region. What is your comment on this? A: We have indeed noted that recently this concept has been mentioned many times. I think that whatever concept or term is employed, we must by no means lose sight of such an objective fact: this region has grown into the most vibrant region with the greatest potential in the world and serves as a major engine for global economic growth. Maintaining the peace, stability and prosperity of this region is of great significance to the whole world. We hope that the Asia-Pacific region can become a stable, prosperous and orderly region where consensus can be reached through consultation and where we are capable of managing differences and have the wisdom to resolve the disputes. We hope that the policies made and steps taken by relevant parties can conform to the trend of the times which is characterized by peace, development and win-win cooperation and help to uphold and promote regional peace, stability and prosperity. Q: During President Trump's visit to China. What kind of food will be served by the Chinese side, the Chinese food or the western food? A: You raised a very detailed question, which shows that you are quite interested in the upcoming state visit of President Trump to China. I have said just now that the work teams of China and the United States are maintaining close communication on the specific arrangements of this visit. Please excuse me for not being able to reveal the details here.